We may not be in the middle of Central Florida’s rainy season now, but it’s going to be here sooner than you think. Typically, for Clermont and surrounding cities, the wet season begins in the middle of May through October. If you have a septic system, you probably already know that large amounts of rain can affect how it operates. But, what about rain and drain fields specifically? One of your septic system’s most substantial parts is the drain field (or leach field), and it can take a significant impact from the rainy season. A drain field is the last part of a septic system and is extremely important in removing contaminants and impurities from wastewater. Made of perforated drain field pipes and natural material, like gravel or sand, your drainfield feels the effect of rain. Once the wastewater travels from the septic system and out of the drain field pipes, it can be filtered thoroughly through the ground. Because the drain field is such a vital part of your septic system, you should keep a close eye on it during the rainy season. Flooding and damage caused by too much weather or moisture could mean problems. 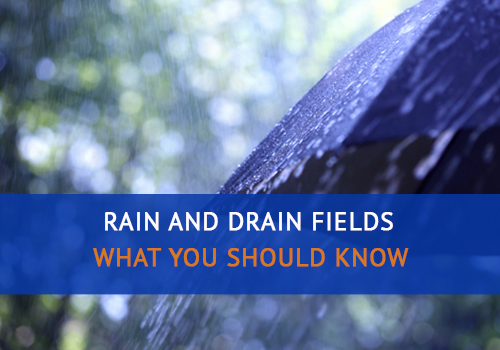 So, let’s discuss vital information to help you care for your drain field during Florida’s rainy season. When it comes to rain and drain fields, preparation is key. Regular maintenance greatly helps your septic system’s vitality and longevity. So, scheduling an inspection with your septic company before the rainy season hits is a fantastic idea. It’s much easier to do any needed maintenance or repairs without heavy rain and saturated ground. Also, this will help you rest easy, knowing that all of your system’s working parts are in tip-top shape. 2. Always adhere to safe activities around your drain field. Never parking machinery or vehicles on top of the drain field. Avoiding digging or construction without knowing exactly where the drain field is. Keeping deep-rooting plants away from the drain field. Other maintenance around your house can help you prepare for the rainy season. Clear out debris from rain gutters and position runoff gutters away from the drain field. 1. Watch for signs of stress on the drain field area. If you realize that your drain field is holding too much water, checking your gutters and other surrounding runoff gutters again is a good idea. Heavy rains could move or break something that is a quick fix. However, we don’t suggest trying to diagnose a septic problem when it comes to your drain field. Keep that to the professionals. Keep in mind, you don’t have to be looking at the drain field to tell if it’s stressed. Strange odors in the house or backed up/flooding drains could also be tell-tale signs of drain field issues. Taking note of these clues can help you combat the flooding by reducing the stress you are putting on the septic system. 2. Reduce stress on your system. One great way to decrease the stress on your property’s septic system is to be conscious of your water usage. Combine laundry loads and take shorter showers to reduce the amount of water you use. If these symptoms do not clear up after the rain settles, you should call a professional. The quicker you catch the problem, the less stress you will put on your septic system in the long run. Of course, our number one suggestion is to schedule an inspection after the rainy season ends. Just because you survived the rain does not mean that you’re in the clear. Keep this septic victory going into the next season! After your septic system experienced high volumes of rain, you want to have a licensed professional check that all parts are intact and working efficiently. Silt can be a problem for your septic tank after the rainy season. If suggested, you may want to pump the tank. 2. Remove any debris from your drain field. Storms and high winds can blow debris into your drain field. If you can safely, remove the debris. 3. Enjoy a break from the rain. The rain has stopped, and the sun is finally out. Your life doesn’t always have to be septic central. We like to do the work for you so that you can enjoy your house and family! As always, we are happy to help you prepare for the coming rainy season. Whether you have questions or would like to schedule an inspection, contact us at Advanced Septic Services (352)242-6100.